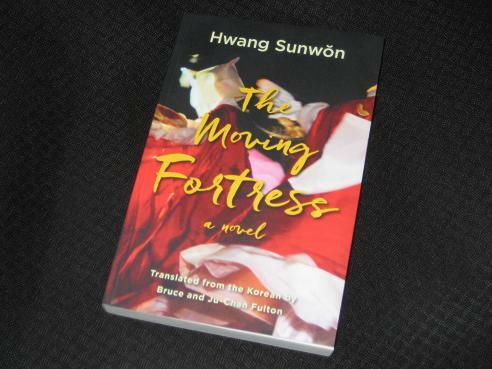 Hwang Sun-won’s The Moving Fortress (published by Merwin Asia, review copy courtesy of the translators Bruce and Ju-Chan Fulton) is a reworking of one of the Fultons’ first translation efforts. According to the afterword, the original English version was released in 1985 under the title of The Moving Castle, and this retranslation, built on thirty years of extra experience, is apparently far shorter than the original Korean, cutting superfluous, repetitive language that the Fultons were not brave enough to excise first time around. With most western readers unlikely to ever stumble across a copy of the original version, it’s good that Merwin Asia decided to commission a new edition, as The Moving Fortress is an excellent read and an interesting look at the Korea of around 1970. There are certain similarities with other works of the period (or slightly later), with hints of the social criticism that fuel Yang Gui-ja’s A Distant and Beautiful Place or Cho Se-hui’s The Dwarf, yet in many ways Hwang’s work is a more rounded and compelling novel, with the social aspects taking a backseat to the story. The story begins in the oddly named Rocky Hollow, around seven miles outside Seoul, where Songho, a Presbyterian minister in training, has settled. His choice of career has less to do with a calling than with the guilt he feels over an affair he had in his youth, his position among the poor surrounding the nation’s capital a sort of atonement for his weakness. It’s here that we also encounter Mingu, an old friend of Songho’s, who has a very different lifestyle. Despite being engaged to the daughter of a powerful church elder, he is a university lecturer obsessed with the native animist religion, in particular with the rituals of the mudang, or female shamans. Moving outwards from this initial meeting, we follow the two men and are gradually introduced to several other important characters. There’s Unhui, Mingu’s fiancée, a spoiled young woman who suspects her partner is up to no good; Ch’angae, a beautiful designer who is to make Unhui’s wedding dress; Ch’angae’s estranged husband, Chunt’ae, an agricultural scientist stuck in a rut; his new acquaintance, Chiyon, a lonely woman who turns out to be good friends with Songho… These relationships are important, as The Moving Fortress relies less on plot than on the ties developing between the main characters, and the way they are influenced by the society they are living in. Still, worse is to come. When Songho’s early misdemeanours come to light, he’ll see just how hypocritical and unforgiving some Korean Christians can be. Each of the characters gradually comes to see themselves as slightly restricted in some way or another, whether by their partner, their work or their health. As mentioned above, not much really happens, but there’s always the sense that it might. I wouldn’t say Hwang is the best Korean author I’ve read in terms of the actual quality of his writing at a sentence level, but he’s certainly an excellent story-teller. The great strength of The Moving Fortress is the way in which the lives of the main characters are cleverly intertwined, allowing us to see each one from several angles. At first, their chance encounters and hidden connections seemed a little fortuitous, but this is mainly due to the tight-knit nature of Korean society and the importance of relationships. On several occasions, one of the characters provides an important introduction to another, opening the door to a new circle of acquaintances. The more the novel progresses, the more we learn about Songho, Mingu and their friends, and Hwang does a pretty good job of making us interested in their (fairly bourgeois) troubles. I doubt that this novel will usher in a new wave of interest in Hwang’s work (there’s only so much space in the general public consciousness for Korean literature, and I suspect that Han Kang and Bae Suah will be sucking up all that oxygen for the foreseeable future), but it’s a book many readers would enjoy. While the issues the characters face are universally recognisable, there’s a distinctive Korean element to the novel which sets it apart. Hwang is far better known for his shorter fiction, but The Moving Fortress would certainly make a good introduction to his work, a novel reflecting the era it was written in, yet universal enough to appeal even to those with a limited knowledge of Korean culture. “apparently far shorter than the original Korean, cutting superfluous, repetitive language” That’s a red flag to me: no matter how bad the original might be, I want this “badness” to be translated. What would be left of Gertrude Stein’s The Making of Americans if in some translation they cut her repetitive language? My heart always bleeds over abridged, “improved”, and bowdlerised translations. Unfortunately, sometimes those are the only options for English-speaking readers. On a different note, never heard anything about Korean shamanism before, it must be a fascinating topic to explore. I didn’t really have any trouble with it’s repetition. OTOH, i pretty much trust the Fultons to do the right thing, so I’m looking forward to diving into this again tonight..